The Cessnock District Rescue Squad was formed in 1976 after it was identified that a specialised rescue unit was required for the Cessnock Local Government Area (LGA). Any person trapped following an incident faced a slow and painful extrication whilst emergency service personnel and passers-by used anything available at the time to free the injured. In consultation with all relevant authorities The Greater Cessnock Volunteer Rescue Unit was established with one vehicle containing a basic array of equipment and a handful of community minded volunteers with very little training. In the beginning call outs were few and far between and money very hard to come by, however as the units profile increased so did the generosity of the local businesses and residents. 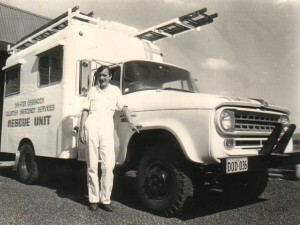 In 1980 the unit became affiliated with the State Emergency Service (SES) and the original rescue vehicle drastically needed replacing. In 1981 A V8 Chevrolet Cab Chassis was donated by local businessman Don Campbell and with extra funds raised by squad members the unit soon had a much better equipped rescue vehicle. Due to the rugged mountainous terrain within the Cessnock LGA it was identified that the squad needed four wheel drive capability and by 1983 enough funds had been raised for the purchase of Toyota Land cruiser. In 1986 the decision was made to affiliate with the NSW Volunteer Rescue Association (VRA) whilst still conducting storm and tempest operations at the request of the SES. Around this same time it was apparent that the Chevrolet was inadequate as a primary response vehicle due to the increased amount of equipment now being carried. Squad members raised the required $40,000 for a Hino truck and body and commenced operations with this vehicle in 1987. To provide more efficient rescue service residents from the Kurri Kurri and Weston areas were recruited and the Chevrolet was transferred to Kurri Kurri with adequate equipment to complete basic rescue operations. In 1990 the Chevrolet was replaced by a Hino to be housed at the Kurri Kurri Base with a similar design to the Hino housed at the Cessnock Base. Following a rise in the number of call outs in the eastern section of the LGA, member numbers were increased in the Kurri Kurri and Weston areas along with extensions to the Kurri Kurri Base to house a second vehicle. The purchase of another Toyota Land cruiser took the squad’s capacity to a primary response heavy rescue vehicle and four wheel drive at each base, a total of four vehicles and around twenty members. This operational capacity has been maintained for over two decades making the Cessnock District VRA Rescue Squad among the best equipped rescue units in NSW. This would not have been possible if not for the outstanding support afforded the squad by many local businesses and residents throughout its 35 year history. Just as crucial is the exemplary commitment of all volunteer members, past and present and the essential support given to them by their families.